On thing that was very much on my list of things to do this year was to get a pair of red leather pumps. I've been wanting a pair for a while now but haven't found any that 1. I liked or 2. fit despite searching for months and months. Then, just after Christmas I saw the perfect ones. Of course, at that time I had maxed out my shopping budget with all the Christmas gifts so I had to wait. Then this week I happened to pass that very same shop and saw that they were on sale. What's a girl to do? Who can pass on a good sale when it's something that you wanted for so long? Not me. So they were quickly whipped up and carried home lovingly and happily. I plan to wear them with jeans and a cute blue shirt, or perhaps with a black pencil skirt and a white top? 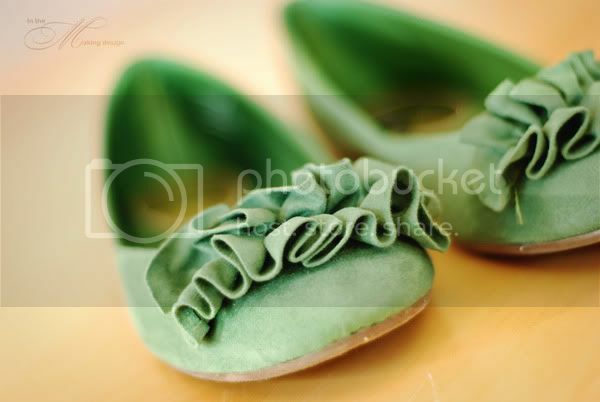 Then just to top it all off, yesterday I happened to stumble across the cutest pair of green ballet flats ever. Soft suede with a ruffle in the front. Man alive, I just had to have them. Just had to. So this week I picked up two pairs of shoes. I can't wear them just yet because it's still too cold. But I can't wait. Think you've just inspired me to be a little more adventurous in my choice of shoes. Both pairs are gorgeous! What lovely pairs of shoes, thanks for sharing your NEW52. I'm glad you couldn't pass up that sale...those shoes are beautiful!